Senator Bam Aquino informed the public to brace for the increase in prices of basic commodities in 2018 due to the Tax Reform for Acceleration and Inclusion (TRAIN) that was enacted into law recently by the government. “We won’t be surprised by the increase in prices in 2018. Ito ang dahilan kung bakit kumontra tayo sa pagsasabatas ng TRAIN dahil masasagasaan nito ang mga kababayan nating mahihirap,” said Sen. Bam. Sen. Bam made the reaction after the Industrial Group of Zamboanga warned that prices of sardines will increase starting next year due to the excise tax imposed on petroleum products. “Ito’y isa lang sa inaasahan nating pagtaas sa presyo ng bilhin na ang papasan ay ang mahihirap nating kababayan,” Sen. Bam said. Sen. Bam rejected the TRAIN’s approval due to the inability of government to implement the financial assistance program in time for the increase in prices due to provisions on excise tax on fuel and sweetened beverage tax. During the period of amendments, Sen. Bam pushed for the immediate implementation of the cash transfer program to help poor Filipinos absorb the expected increase in the prices of goods and services. However, Sen. Bam’s proposal was not accepted by the DOF. “In the end, poor Filipinos will bear the brunt of this tax reform program as it will increase the prices of basic commodities without the immediate cash transfer assistance to the poor” said Sen. Bam. Sen. Bam renewed his call to the government to speed up the implementation of the cash transfer program so poor people won’t be burdened by the increase in prices. Sen. Bam is also hoping that the increase in take-home pay will be enough to offset the increase of prices of goods and services. In addition, the lawmaker urged the government to focus on improving the performance of revenue-generating agencies such as the Bureau of Customs (BoC) and the Bureau of Internal Revenue (BIR). Data from the Finance Department shows that an additional P726 billion can still be collected by government by addressing inefficiencies and removing loopholes in the BIR. The government can also collect at least P231 billion if the importation gap and smuggling is resolved by BOC. All three branches of service of the Armed Forces of the Philippines (AFP) expressed full support behind Sen. Bam Aquino’s bill to provide AFP reservists with job security while rendering military service for the country. 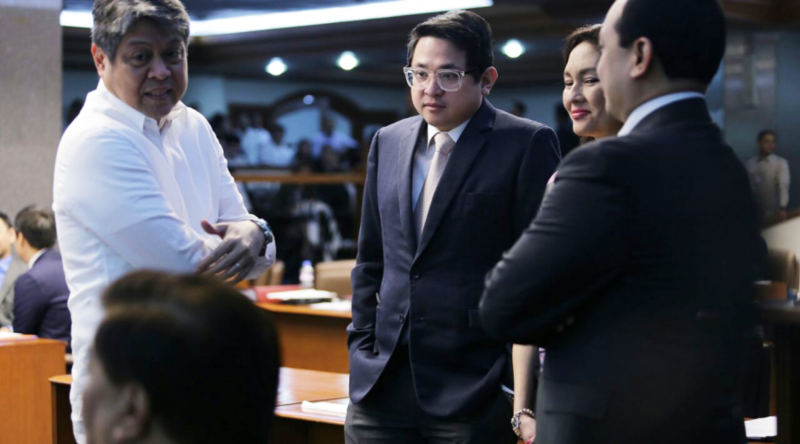 “This is one of the ways we show our gratitude for the service you provide,” Sen. Bam Aquino expressed to the AFP during the hearing of the Subcommittee for Labor and Employment on Senate Bill No. 1607 or the Reservist Employment Rights Act. Ranking officials from the Air Force, Army and Navy, as well as other stakeholders expressed their full backing of Senate Bill No. 1607, authored by Sen Bam, and all committed to work together to encourage more Filipino reservists to be more active in rendering service to the nation. According to Rear Admiral Roberto Empedrad, the AFP Deputy Chief of Staff for Reservists and Retiree Affairs, SBN 1607 is the much needed reinforcement to fully implement Section 32 of RA 7077. The AFP official said that the concern of reservists regarding their security of tenure in their civilian jobs hinder the mobilization and training of the kind of reservists most needed by the AFP. Rear Admiral Robert Empedrad said Senate Bill No. 1607 authored by Sen. Bam amplifies and puts flesh to the provision of Section 32 of RA 7077, which provides for security of tenure for reservists in their civilian jobs. “The enactment of Senate Bill No. 1607 is very important to us since it will help in the administration of our unsung heroes, our volunteer reservists,” said Rear Admiral Empedrad. Air Force Vice Commander, M/Gen. Jose Tanjuan said Senate Bill 1607 is in harmony with the general provisions of RA 7077, as it particularly strengthens its manpower development provision. He added that the measure also supports the Labor Code’s provision covering the security of tenure on employment of reservists undergoing annual duty training and mobilization. “With the enactment of bill, reservists shall be more motivated and focused on their task since they will be unburdened with the problem of security of tenure and compensation,” said M/Gen. Tanjuan. B/Gen. Gilbery Gapay, chief of staff of the Philippine Army, also expressed full support for the enactment of the measure into law, saying it will help in enhancing one of the most important programs in the Army. Concerned government agencies, such as Government Service Insurance System, Department of Labor, Social Security System and PAG-IBIG Fund also expressed willingness to help enhance the measure, making it attuned to the present needs of reservists. Under Sen. Bam’s measure, reservists shall be entitled to their original position, or to a substantially equivalent position, without loss of seniority rights, and diminution of pay. The bill also ensures that companies cannot require reservists to use their standard leave credits entitled them for absences, for the military service they are required to render. Furthermore, the bill protects reservists who suffered any injury or disability as they would still be entitled to reinstatement as long as they can perform the essential function of their original employment. The measure also gives adequate training for reservists, compensation for non-reinstatement and military service and penalties employers in case of discriminating any employee or job applicant for being a reservist. Sen Bam said that this bill is intended to bolster further the Reserve Force Development program of the AFP and ensure that we encourage more professionals, specialists, and subject matter experts to help in our national security by being active reserve officers of the AFP. “With this bill, we hope that the Category One types, ages 18 – 35 years old, who are most needed will be more encouraged to sign up and be active,” said Sen. Bam. Poor Filipinos will have to deal with higher prices of goods and services without any financial assistance from the government once the tax reform program it is implemented next year, according to Sen. Bam Aquino. “While the government is determined to implement the tax reform program starting next year, it will take months before it rolls out the cash transfer program for poor Filipinos,” said Sen. Bam. However, the DOF said it cannot immediately implement the cash transfer program and the Tax Reform for Acceleration and Inclusion (TRAIN) at the same time. In the period of amendments, Sen. Bam pushed for the immediate implementation of the cash transfer program to help poor Filipinos absorb the expected increase in the prices of goods and services. However, Sen. Bam’s proposal was not accepted by the DOF. During its ratification, Sen. Bam rejected the TRAIN’s approval due to the inability of government to implement the financial assistance program in time for the increase in prices due to provisions on excise tax on fuel and sweetened beverage tax. “In the end, poor Filipinos will bear the brunt of this tax reform program as it will increase the prices of basic commodities,” said Sen. Bam, who rejected the measure despite supporting the increase in take home pay for workers. “Sana mahanapan pa ng paraan, na sa madaling panahon, masabay nila ang pinansyal na tulong doon sa pagtaas ng taxes at pagtaas ng presyo ng napakaraming bilihin sa ating bansa,” added Sen. Bam. Instead of passing the burden to poor Filipinos, Sen. Bam said the government should focus on improving the performance of revenue-generating agencies such as the Bureau of Customs (BoC) and the Bureau of Internal Revenue (BIR). First of all, Mr. President, let me just say that my no vote at the ratification is by no means an indication of the leadership and the diligence of our Chairman. Our Chairman worked very hard for this bill, and I believe he really did his best to come up with the best version that he could, with the circumstances given to him. However, Mr. President, if I I could explain my vote, the DOF knows that there was really one major provision or one major aspect of this bill that was important to this representation. At yun, Mr. President, yung epekto ng batas na ito sa napakaraming mahihirap sa ating bansa. Totoo po, Mr. President, merong 6 million Filipinos ang matutulungan ng batas na ito. 6 million Filipinos, in fairness, Mr. President, and will congratulate this portion of the bill, will go to the larger take-home pay. However, Mr. President, in the records of the Department of Finance, in their deliberations, in their presentations to the individual senators, lumalabas po talaga na dahil sa pagtaas ng bilihin, we’re looking at the bottom 40% of the Filipino people who will carry the brunt of the tax reform because of the increase in prices. Now, Mr. President, a lot of us have raised this issue. At yung na-mention po ng DOF na tulong sa ating mga kababayan ang unconditional cash transfer. In short, Mr. President, yung pang-balanse sa napakaraming pamilyang Pilipinong naghihirap dahil sa pagtaas ng presyo ng bilihin, at yung pagbibigay ng 200, or- ngayon po 200 pero initially in the Senate version 300 pesos per month na tulong, financial assistance to the bottom, roughly 10 million families to help them with the increase in prices because of the tax reform. Mr. President, with that assertion, marami po sa atin, napanatag ang kalooban. However, Mr. President, lumabas po doon sa ating interpolation, at lumabas po doon sa ating pananaliksik ng DOF at ng iba pang mga ahensya, na hindi po kayang i-implement ang programang iyon na kasabay sa pagtaas ng presyo ng ating bilihin. And Mr. President, yun po siguro yung isang bagay na para sa akin, hindi ko pwedeng suportahan ang batas na ito kung hindi maisasabay ang tulong na pinansyal sa ating mga kababayan doon sa pagtaas ng taxes ng napakaraming produkto sa ating bansa. And I hope, Mr. President, this no-vote will spur our agencies to work faster, and this is, of course, DOF, DSWD, and other concerned agencies, na sana po, hindi gaya ng sabi nila, na hindi kayang isabay ang programa doon po sa pagtaas ng presyo ng mga bilihin. Sana po mahanapan pa po nila ng paraan, na sa madaling panahon, masabay po nila yung programang tulong na pinansyal sa mga kababayan natin doon po sa pagtaas ng taxes sa napakaraming presyo, sa napakaraming bilihin sa ating bansa. And because of that, Mr. President, I, unfortunately, cannot support this measure. Thank you, Mr. President. The tax reform package will increase prices for all Filipinos without the necessary safeguards to protect our poor countrymen. This is the reason given by Senator Bam Aquino as he rejected the approval of the Tax Reform for Acceleration and Inclusion or TRAIN. While Sen. Bam is a co-author of the income tax reform bill and is in full support of increasing the take home pay of many Filipino working class, he voted no to the bundled tax reform package due to the provisions on excise tax on fuel and sweetened beverage tax, which will lead to higher prices of goods and services. “I cannot, in good conscience, vote for the approval of this tax reform package. Hindi ako pabor sa mga probisyon na magdudulot ng pagtaas ng presyo ng bilihin, lalo na dahil ang mga mahihirap na Pilipino ang pinaka tinatamaan dito,” said Sen. Bam on his no-vote for the tax reform package. To cushion the blow to the poor, the Department of Finance proposed a cash transfer program with a P200 monthly financial assistance on the first year and P300 monthly financial assistance for the second and third year to help cover the increase in prices of basic goods. 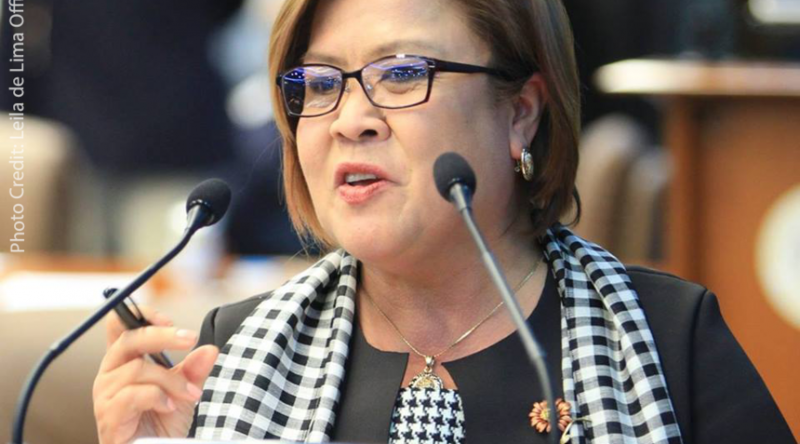 But during the period of amendments in the Senate, Sen. Bam’s proposal requiring the financial assistance mechanism to be in place before taxes are increased was not accepted. “Hindi dapat ipataw ang mga bagong tax na magpapataas ng presyo ng bilihin, tulad ng excise tax on fuel, hangga’t hindi nasisigurado ng gobyerno na magiging maayos ang unconditional cash transfer program,” Sen. Bam stressed. The DOF admitted that they cannot implement the financial support program for poor families in time for the price increases because of TRAIN next year. The senator also lamented that the government is forcing hardworking Filipinos to compensate for our inefficiency in tax collection of both the Bureau of Customs and the Bureau of Internal Revenue (BIR). Based on data from the Finance Department, Sen. Bam said the government can still collect an additional P726 Billion or 6.44% of GDP if we simplify, address inefficiencies and remove loopholes in BIR. The government can still collect at least P231 billion or equivalent of 2% of GDP if the P1.8 Trillion importation gap or smuggling is resolved by BOC. “Para sa pamilyang Pilipino, lalo na para sa mga mahihirap nating kababayan, kontra po ako sa pagtaas ng buwis at pagtaas ng presyo,” Sen. Bam said. Senator Bam Aquino voted to reject the government’s call to extend Martial Law in Mindanao because of the absence of actual rebellion now that firefighting in Marawi City has ceased. Sen. Bam mentioned that in the deliberations of the 1987 Constitution, the framers used the word actual instead of imminent so as not to create confusion and not to give the President a wide latitude of discretion which may be abused. Also, Sen. Bam believes that the one-year extension is too long, which could abrogate the Congress’ duty on check and balances, which is provided by the Constitution among the branches of government. “One year seems unreasonable. It is akin to being indefinite as there are no clear milestones to reach and no distinct reasons for needing an entire year,” said Sen. Bam. “The period of the original declaration is 60 days. Any extension should be reckoned in this light, so 1 whole year really seems grossly unreasonable,” said Sen. Bam. Sen. Bam stressed that Martial Law is an extraordinary measure and that the military should not need Martial Law in order to function well and keep Mindanao secure. “The reasons given by the Executive are persistent all over the country, not just in Mindanao. The logic used in the request for extension can easily be used to declare nationwide Martial Law,” warned Sen. Bam. We, members of the minority, support the position of Mindanaoans for NO martial law extension in their home island. Lifting military rule, specifically in Marawi, will hasten the return of affected residents to their homes, according to its citizens. Martial law, together with the air strikes, was the reason why they fled Marawi in the early days of the Maute siege. And martial law is also the reason why they are afraid to return, even in cleared areas. After the pronounced liberation of Marawi and the announced focus on rehabilitation and trade, what will be the role of the people of Marawi in the planning and rehabilitation of their city? What guarantees do they have that they can return to their old location and start life anew? As security forces reign supreme during martial law, would not military rule actually get in the way of a people-centered rebuilding and rehabilitating of the once vibrant city? What is the need for martial law? Would martial law suspend bidding for the reconstruction of the city? We warmly congratulate Sen. Leila de Lima for being named by Foreign Policy as one of 2017’s leading Global Thinkers. FP could not have bestowed this award on a more deserving public servant. Sen. Leila’s dedication to the cause of justice and human rights in the country, especially where it concerns the brutal war on drugs that has taken thousands of lives in the span of a year, has not gone unnoticed. Her steadfast convictions have captured the interest of people all over the world and have started a global conversation that throws into sharp focus the dangers and abuses happening under this administration’s ruthless anti-drug campaign. Despite her detention, she remains true to her principles, and is resolute and unwavering in her beliefs. Sen. Leila’s continued battle gives hope and courage to those who feel helpless amid the rampant injustices in our society. We are proud to have such an indomitable spirit among our ranks, and we will stand by her as she carries on with her campaign against injustice and human rights abuses in our country. This award serves as a reminder to all of us that you can never put a strong woman down, much less one who sides with truth.